Town leaders said it was the first time in Chilmark history that a house had been demolished due to coastal erosion. But it almost certainly will not be the last. Natalie Conroy's house is perched one edge of cliff. An examination of town assessors records by the Gazette shows that upwards of 25 homes are situated along the rapidly eroding coastal edge from Lucy Vincent Beach to Squibnocket Point. Plans are already in place for some to be moved in the coming months. Others stand about 200 feet from the edge. Stonewall Beach, Squibnocket Beach and Wequobsque Cliff are particular areas of concern. Homeowners on Greenhouse Lane, Stonewall Lane, East Lane, Periwinkle Lane, Azalea Lane and Wequobsque Road have all applied to the conservation commission for so-called soft solutions to mitigate erosion, or for house relocation. Approved soft solution techniques have included coir logs, jute netting and beach grass plantings. Moving homes along coastal embankments falls under the authority of the town conservation commission, which administers and enforces state and local wetlands laws that apply to oceanfront, beaches, tidal flats and coastal dunes and embankments. The conservation commission reviews every application on a case-by-case basis. About five property owners moved their homes or applied for relocation during her time on the commission, Mrs. Goff said. A town bylaw prohibits new building within 100 feet of a coastal embankment, and the state Wetlands Protection Act of 1978 bans new bulkheads, revetments and engineered structures. “We have to look at this law and say, what are the interests, what does this resource have that we’re protecting, what are its value? We want to make sure anything they do to move their house doesn’t diminish the value of that,” Mrs. Goff said. Conservation Commission's Pam Goff and Sandy Broyard. farmers could be near running water and their fields. 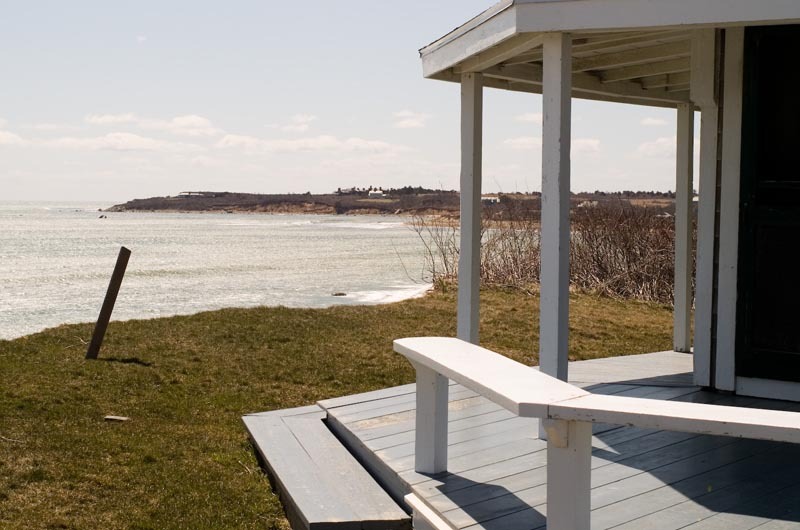 It wasn’t until people began building summer homes in Chilmark in the 1940s and 1950s that homes began to be built closer to the ocean. “A lot of the buildings were camps, where people could run to the beach and they were of no huge value,” Mrs. Goff said. “It’s a relatively modern phenomenon [building near the sea], because people built in the way of nature. It’s a natural force they can’t moderate,” she added. “When I came to the Island in 1964, none of them were insulated; in fact it was bizarre to have an insulated house,” Mrs. Broyard said. “And it was about bare feet and sweeping,” Mrs. Goff said. “And your old Vineyard clothes,” Mrs. Broyard added. Mrs. Goff remembered touring Bell’s Point on the south shore between Lucy Vincent and Squibnocket with the late David Flanders during her early years on the conservation commission. “He would look out and say — see that rock out there? Well that was the close edge of a pasture where I used to keep cows. That was hundreds of feet that he could say had eroded in his lifetime. 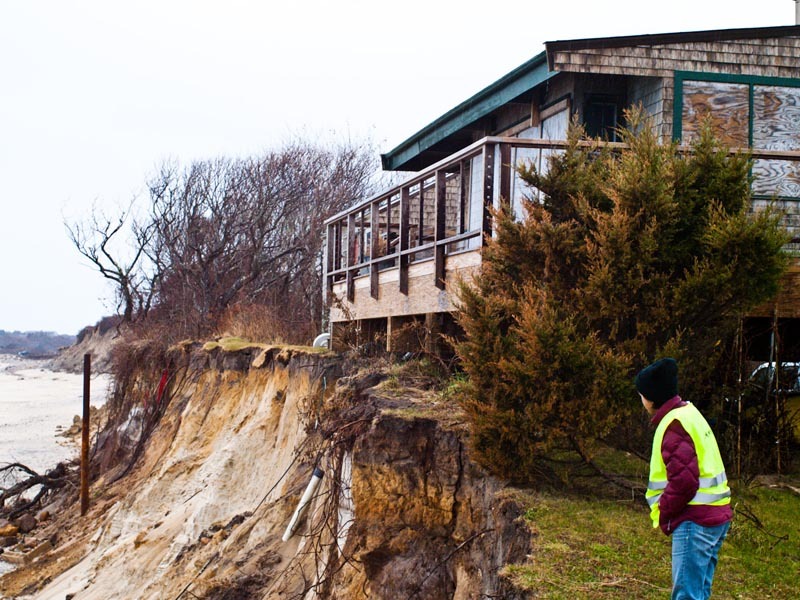 The first home to be moved in Chilmark due to cliff loss was in the 1980s, according to building inspector Leonard Jason Jr.
Today there are a number of moving plans under way. This spring the conservation commission approved a plan to demolish a 1,100-square-foot home on the Langmuir property on Greenhouse Lane and rebuild a smaller version of the house 500 feet farther back from the coastal embankment. The relocation of three small bunkhouses was also approved. Langmuir home will be relocated. The Langmuir houses now stand less than 10 feet from the cliff. A deep fissure lies five feet from the main house. A new driveway was approved to come in from Greenhouse Lane off the back of the property. The new location for the house does not meet the 50-foot setback requirement and will need a special permit from the town zoning board of appeals before the move can begin. When Jane Langmuir and her son Karl Langmuir brought their plan before the conservation commission in April, they said the family was committed to protecting the area. A home belonging to Jim Belushi near Lucy Vincent Beach was successfully moved two years ago (an image on Google Maps shows the imprint of the former house site). The home of Patrick Lyons on Wequobsque Road was built with a moveable foundation; the owners knew that the main house would have to be moved eventually. A guest house and swimming pool have since been built near where the main house will eventually be moved. The Walters house on Greenhouse Lane may be the next one threatened, Mrs. Goff said. “I think they’re going to live in it until it’s gone,” she said. “I know the person who sold them that house 12 years ago and warned them,” added Ms. Broyard. The property is currently for sale with an asking price of $1.6 million and an assessed value of $2.5 million. The 2,100 square foot home dates to 1934. 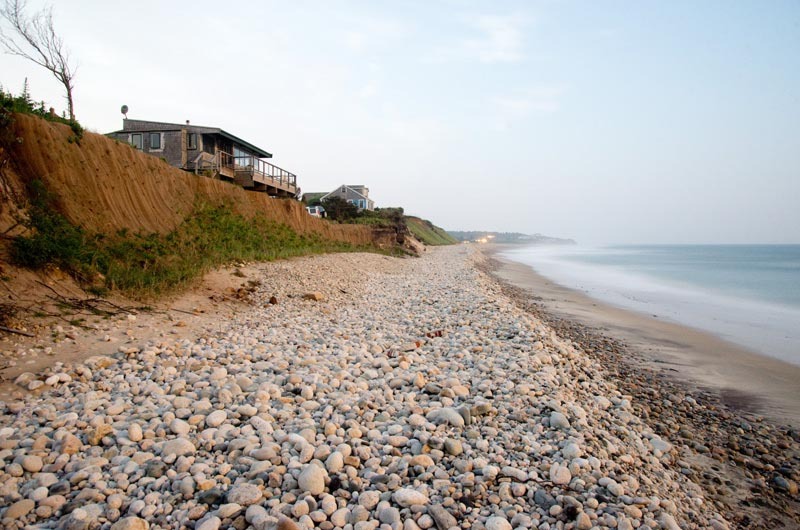 As land slips into the ocean, Chilmark, which has one of the lowest property tax rates in the commonwealth, could feel the effect on its tax base, from abatements for loss of land to the elimination of beach lots. Assistant assessor Pamela Bunker said she anticipates an increase in abatement applications for properties in the Wequobsque cliff and Stonewall Beach areas, as they are sold. “That’s where we’re having a lot of erosion, there and the Greenhouse Lane waterfront area,” she said. A home at 11 Azalea Lane threatened by erosion has seen a yo-yo effect on its value in recent years. The property was assessed at $6.8 million in 2009 and sold for $2.4 million. It was resold in August 2012 for $4 million. And the cliffside is still eroding. Sandy brought destruction, gawkers to Lucy Vincent Beach. against large chunks of newly-exposed clay, and the red cliff that is a landmark at the beach had been dramatically altered. 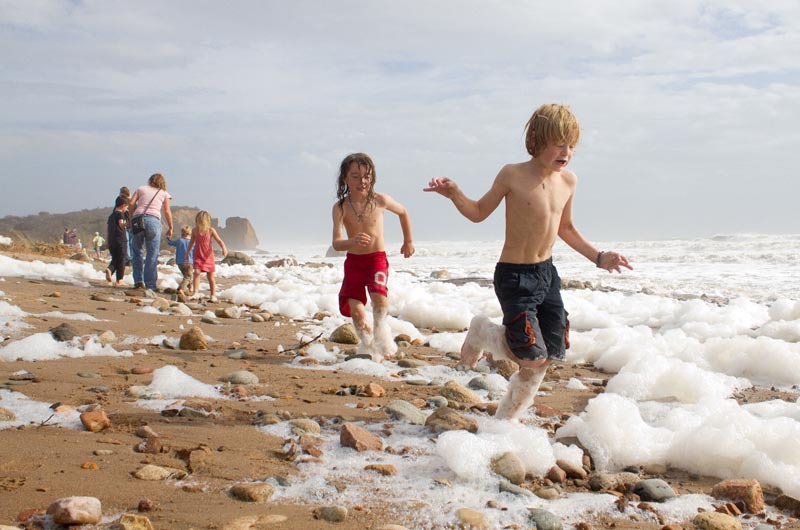 Children waded in the edge of the surf as white foam rolled over the sand. The town has run low on options for stemming the erosion at exposed beachfront areas like Lucy Vincent. In the past, it had planted beach grass, stacked hay bales and put up snow fencing to help rebuild the dunes. 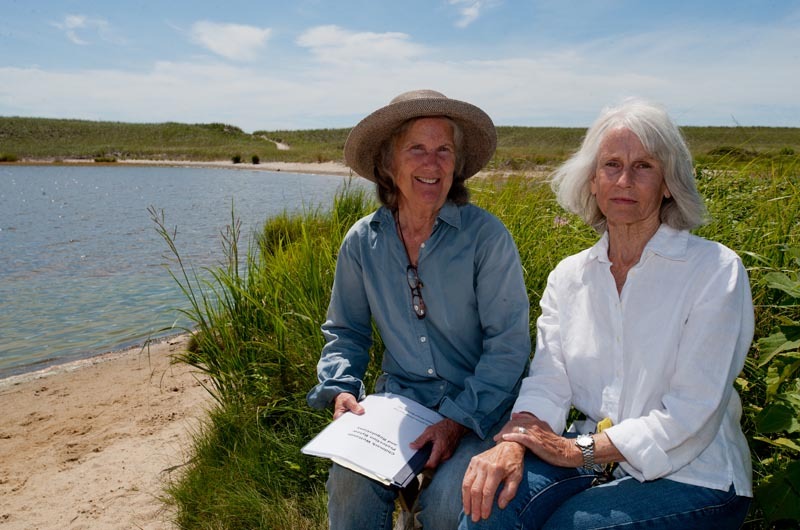 But in 2010, the state denied the town a permit for additional snow fencing and hay bales because the area is a habitat for the protected piping plover, a tiny shorebird that nests on barrier beaches. Progress on beach nourishment and planning “is at a standstill,” said Mrs. Bunker, who is also the chairman of the town beach committee. The committee hired the Woods Hole Group in 2012 to do a study of Lucy Vincent Beach to evaluate mitigation techniques, which included coir logs and pumping sand onto the beach. This fall the town is set to address a series of complicated issues at Squibnocket, where Hurricane Sandy severely damaged the town beach parking lot and compromised the entrance road to Squibnocket Farm, an enclave of private homes. Chilmark selectman Bill Rossi heads an advisory committee appointed to examine the problems. Options under consideration include building a raised causeway to Squibnocket Farms over an abutting wetland and removing the revetment. “The revetment seems to be proving to be not a good thing for protecting bluffs and a detrimental effect on either side,” Mr. Rossi said. The town only owns the small amount of beach directly in front of the revetment, which has dwindled in recent years. At high tide the water often reaches the base of the revetment leaving no area for bathers to sit and forcing them onto neigboring private property. The committee is also looking into leasing additional land from the property owners, including the Vineyard Open Land Foundation, which developed Squibnocket many years ago. Last summer some residents returned their town beach stickers due to the lack of beach at Squibnocket. Fissures along cliffs weaken foundation from within. “We really don’t technically have a beach,” Mr. Rossi said. “We’re trying to expand on that to the east and west. There seems to be an acceptance of that from everyone involved,” he said. Mr. Rossi has been watching the beachfront there since he was a kid. “The changes seem to be a little more significant in the last year years certainly,” he said. 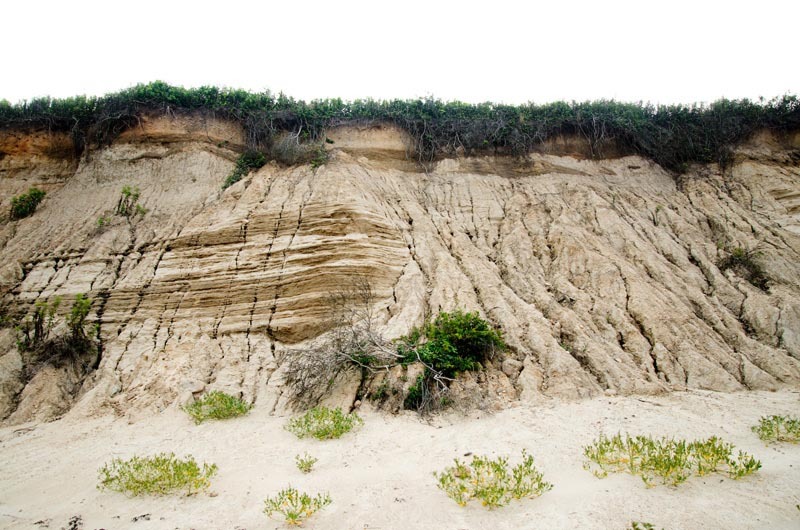 “It’s obvious that there’s an issue with erosion and I feel badly for some property owners. It’s unfortunate for them and I think at the time when people made choices 30 or 40 years out, it seemed like a long time, but it came quicker than most people would like. The Chilmark conservation commission is paying close attention to how other Island towns are addressing issues related to erosion, including the Schifter home on Chappaquiddick. When Natalie Conroy came before the conservation commission in February, she had run out of options. Her plan to move her homes nine and a half feet back from the cliff would have put the main house smack in the middle of an access road to a neighboring property and at the edge of a freshwater wetland.